So often in life we find ourselves at a crossroads moment, struggling to know what the right way is. There’s the fear of doing the wrong thing, of heading off in the wrong direction or worse yet…loosing your way! •	Many Spirit Guides were involved in your pre-incarnation process so they know your Sacred Contract. This gives them a far greater perspective of your life than you and can shed light on the currents at work in a current life situation. •	Your Spirit Guides are your own personal cheerleaders, standing on the sidelines cheering you on…no matter what you do. 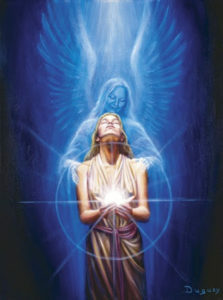 Your Spirit Guides are unconditionally loving and accepting of us. •	Your Spirit Guides have no vested interest in a particular outcome. They know that if you don’t figure it out in this lifetime you’ll have plenty of other opportunities! Having that degree of freedom tends to take the heat off! •	There’s no such thing as failure in the eyes of Spirit, only taking the long way around. •	Your Spirit Guides will naturally accommodate any new direction and move to assist you in your chosen path. •	Your Spirit Guides don’t like to tell you what to do. They will never interfere with free will. I is your God -given right. Even milestone, pre-planned events in your life still have a degree of free will built in. •	Your spirit guides only give you one step at a time. Imagine if you knew what was going to happen in six months without knowing all the steps needed to get there? Imagine how overwhelmed you would feel! We are given information in easy to swallow, bite-sized pieces so that we can process and assimilate each step easily before looking for more. •	If you don’t complete one of the divinely guided steps you’ll feel stuck as if you’re spinning your wheels in the mud. The significant opportunity will simply re-emerge again and again until you notice and act. •	Your Spirit Guides offer synchronicities, serendipity, signs and symbols appear in your life to confirm you’re on the right track and to encourage you to continue. I’ve come to realise life is far more flexible than I ever imagined. We have so much freedom! We are here to have adventures and explore all that this life has to offer. We are born to push the boundaries and really make the most of our life! We are creative beings who are co-creating the realty round us. Life is meant to be lived with love in abundance. Our Spirit Guides are doing everything they can to help make that a reality. Spirit Guides can reveal lies hidden in your current situation and offer incredible insight and clarity. But they are not there to make decisions for you. Only you can do that. Their job is to give you enough insight for you to make a choice for yourself. Always remember that your Spirit Guides have your best interests at heart so go with their guidance. Your Spirit Guides are here for you. Invite them to be actively involved in your life. Ask for their help and assistance every day! They are joyful when given the opportunity. They love you and want nothing more than for you to be happy! That is their only wish and motivation. They love you absolutely. They will do anything in their power to help you.